The cast of Starz’s upcoming series Outlander took a few moments out of their day on set before production broke for the holidays to wish fans a Merry Christmas. Not only does the video above offer a bit of Christmas cheer on this December 25, but it also gives us a look at some of the series’ main cast. Based on Diana Gabaldon’s beloved series, Outlander centers on Claire Randall, a British World War II combat nurse who’s on vacation with her husband in Scotland when she finds herself suddenly and mysteriously whisked back in time to war torn Scotland in the early 18th century. She’s eventually forced to marry the gallant Scottish warrior Jamie Fraser, which adds a whole new complication to her situation, as she’s already technically married. The series is being adapted by Battlestar Galactica’s Ronald D. Moore. We’ve seen some glimpses of Jamie and Claire in previously released videos and photos. Just the other day, we shared some character photos and gorgeous set pictures. This new video is an added treat, just in time for Christmas, as it begins with a group shot and then goes to individual clips of cast members wishing fans a Merry Christmas. Among those featured in the video are Caitriona Balfe, who plays Claire Randall in the series, Nell Hudson (Leoghaire), Lotte Verbeek (Geillis Duncan), Graham McTavish (Dougal MacKenzie), Gary Lewis (Colum MacKenzie), Annette Badland (Mrs. Fitz) and Tobias Menzies, who will play both Frank Randall (Claire’s husband) and Black Jack Randall. 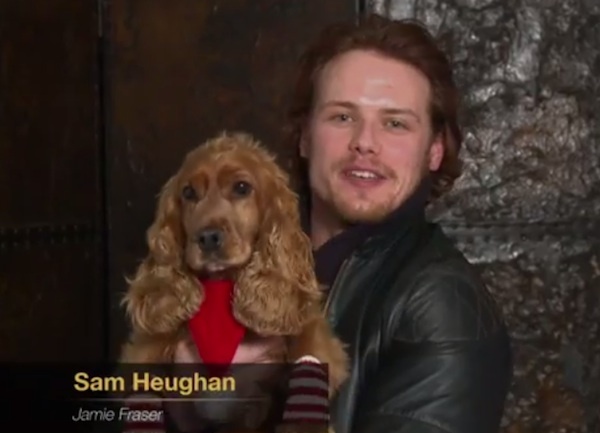 And then, of course, there’s Sam Heughan, who plays Jamie Fraser in the series. He's joined by an adorably, festively dressed dog to wish fans a Merry Christmas. One of Jamie’s dogs, perhaps? Outlander is expected to premiere on Starz in 2014. No specific date has been announced yet.